Our luxurious sets of round table and chairs instantly add comfort and style to your home and will suit you whether you’re limited on space or simply like being flexible on how many can fit around your table. 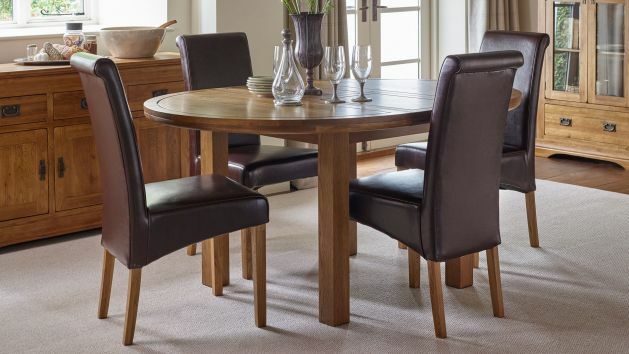 We never cut corners when it comes to quality at Oak Furnitureland, and all our furniture is crafted from premium hardwoods, like solid oak and mango, that have been carefully selected for their superior grain patterns and hues. Our matching dining chairs are equally as impressive and come in a variety of diverse styles. Some of our round dining sets come with wave back chairs that feature braced solid oak legs and ultra-comfy padded real leather seats. For a more classical look, others come with voluptuous padded seats and elegant patterned beige fabric. Whether you browse online or visit in store, there’s a style to suit you. And by buying one of our sets of round dining table and chairs you'll be able to save some money over buying the table and chairs separately. It’s important to make your guests feel comfortable and at ease when dining in your home, and you can set the mood perfectly with your choice of lighting. This can easily be achieved with dimmable lights or using small lamps for a more cost-effective solution. See our Dining Room Furniture Guide for more handy hints to improve and enhance your dining space. Flowers and succulents are a simple yet effective way to expand the colour palette of your dining room. Able to blend into almost any design scheme, a strategically placed flower arrangement or cactus can add a swash of colour and warmth to your dining space. Every Oak Furnitureland order automatically qualifies for free delivery, and your brand-new solid wood furniture will be delivered to the room of your choice as part of the service. Looking to spread payments? No problem. Our flexible furniture financing can make life a little easier for you, and allow you to pay monthly for up to four years.